I saw this on a tv show a while ago but please don’t ask me which one haha. 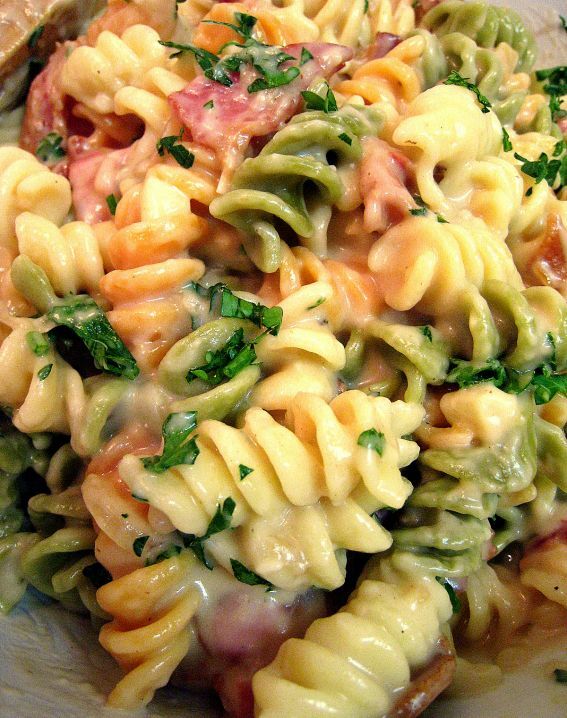 If you love regular mac n cheese you are in for a real treat with this recipe. You probably don’t need to salt the water as the there is already plenty of salt in all the cheese. If you like a little spice in your meals add some chili flakes but not too many.You can use bacon instead of pancetta if none is available or to save a little money. One lady emailed me and said she had chopped up 3 garlic cloves to bake within the dish, added 1 tblsp Dijon mustard and topped with bread crumbs and I must say that sounds like a wonderful addition. 10 rounds of pancetta, sliced into chunks or you can use bacon. Cook the rotini pasta in salted boiling water. With 2 T of olive oil in a sauce pan, start rendering the pancetta slices until golden and almost crisp. Take out the crispy pancetta from the pan and drain off excess oil and retain at least 3 T of oil in the pan. Now, start with the blonde roux. Melt in 3 butter. Saute the garlic and onion. Add 3 heaping T flour and whisk vigorously until well combined and the raw flour taste cooks off. Add the milk and continously whisk until the sauce thickens. When the sauce becomes too thick, add more milk or pasta sauce to thin it out. Add back the crispy pancetta and the cheeses. Lower down the heat and continously stir the sauce. Add a few pinches of ground black pepper. Let simmer for a couple of mins. Take the pan off the heat and quickly toss the rotini with the sauce.